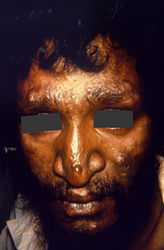 CDC: The face of this male patient exhibited some of the pathologic characteristic associated with a case of nodular lepromatous, or multibacillary (MB), Hansen’s disease. Of note is the presence of cutaneous nodules upon the forehead, nose, cheeks, lips, and chin. The eyebrows are diminished as well. This entry was posted on Sunday, January 28th, 2018 at 10:09 am and is filed under Leprosy .